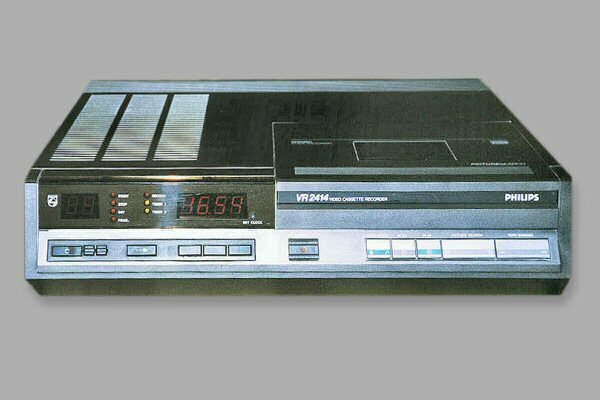 This VCR is one of the smallest of the V2000 format. 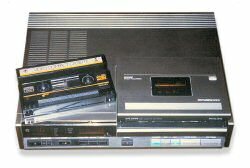 It is a top loading deck similar in design to the Grundig V1600. It is controlled only using the front panel, no remote control is supplied. It features a pre-scanning tuner of up to 16 channels. This is done using two small buttons, one for auto scan and one for memory. It also features both DTF and DNS, but no has no support LP and stereo. The timer supports two events up to 30 day where today is 0-day for example using very simple programming. There is also a proceed button below the display used as an enter button for programming and clock settings. There are two red LED displays, one displaying the channel and the other for the time and counter. Picture search is clear and perfect without dropouts or lines. Recording is done using a single button with no need to push the stop button afterwards. It is also possible to press the still frame from stand-by. All in all a very simple and responsive deck to operate.